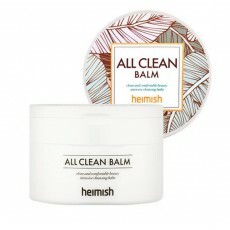 Heimish All Clean Balm is your choice of oil based cleanser to remove heavy makeup easy and convenient! It is called a spa cleanser because of its smooth spa like consistency and the natural aroma oil that makes cleansing a relaxing routine. It cleanses deeply without irritating and drying your skin. Suitable for sensitive skin. Use spatula that comes with the product to scoop out adequate amount of the balm. Spread on dry skin and massage in circle motion. You can also massage on eyes and lips using fingers or cotton swab. Once makeup had melted, add a little bit lukewarm water and massage again until it turns milky. Rinse with lukewarm water properly.